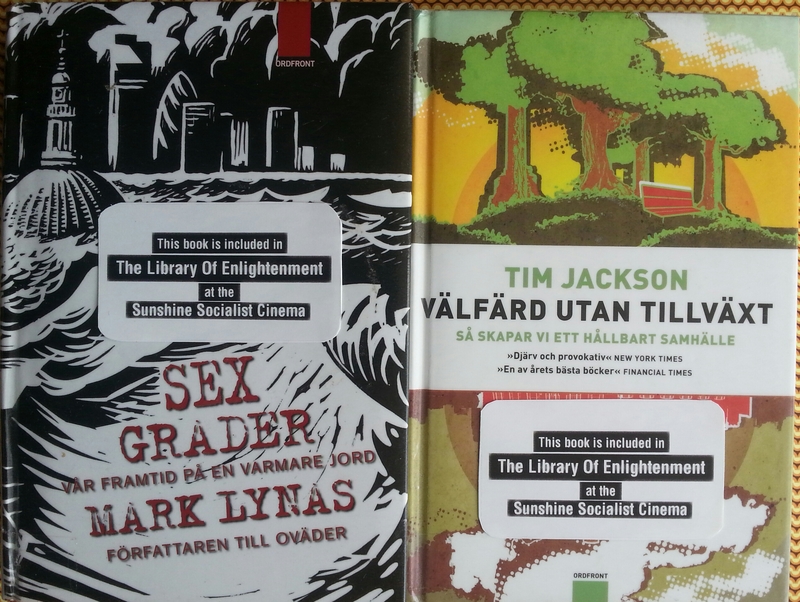 Our studygroup has read through a number of books in preparation for the upcoming Climate Film Festival in Stockholm. Some of the books have also found their way into our Library Of Enlightenment. Overall, it’s been an extremely depressing reading session. Six Degrees by Mark Lynas seems to be very well-researched, and paints a dark picture of what to expect the consequences upon our natural environment to be at a medium-temperature rise of one degree, of two degrees, of three degrees etc., up until a rise of six degrees. Since a rise of two degrees, as far as we understand it, is already unavoidable due to various slef-enhancing effects, even if we were to cease all emissions today, the first two chapters of the book are already a reality. So, apart from trying to find ways to reduce and stop emissions, we should also be looking for ways in which to live with chaotic climate conditions – ways in which to organise society, ways in which to deal with psychological consequences, cultural consequences, ethical and moral consequences. Prosperity Without Growth by Tim Jackson goes into the economics and the politics of a sustainable society. He writes about a green version of the New Deal, and a return to Keynesian economics. It basically means that public investments can be politically directed towards environmentally beneficial projects, like for example clean energy. Chapter 10, which deals with what the political system can do to curtail unfettered expansion and growth is interesting for all the things it leaves out – what form of government would be suited to organise society in a chaotic climate? Jackson speaks of the schizoid condition for governments of today, as they are on the one hand bound to the idea of constant growth, and on the other hand bound to the defense of the public good. 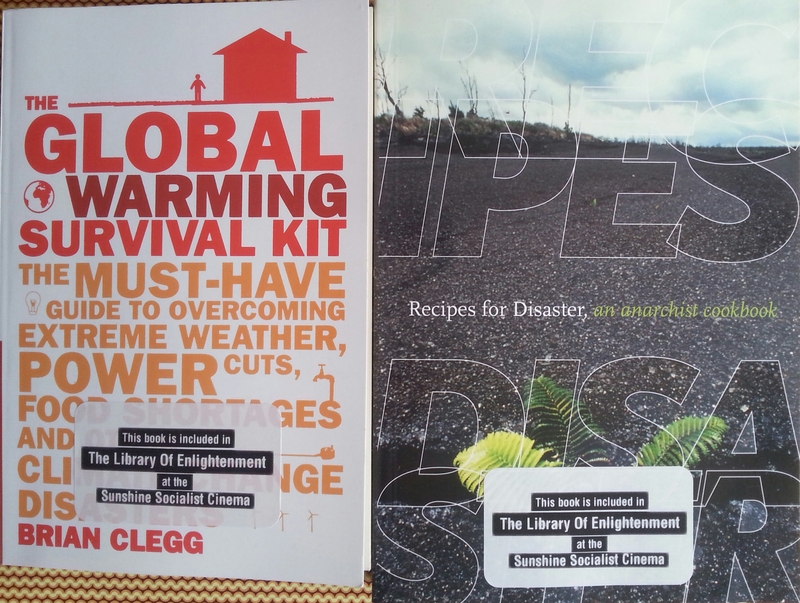 We’re trying to include as many practical handbooks as we can in our library, and were excited by the title of Brian Cleggs The Global Warming Survival Kit. But here’s a book which deals mostly with how to equip your home or house to withstand harsh weather conditions and power cuts, while skipping the societal level. Here’s tips on how to be one of the first people at the gas station when there’s a fuel shortage coming up, and never mind those who arrive late. Here’s tips on how to defend yourself and your family against looters, and never mind arranging for equal distribution of necessities. Recipes For Disaster, An Anarchist Cookbook wins our hearts in this category, though the practical tips in this book might not be able to save us from catastrophic climate in any other way than through preserving our dignity. 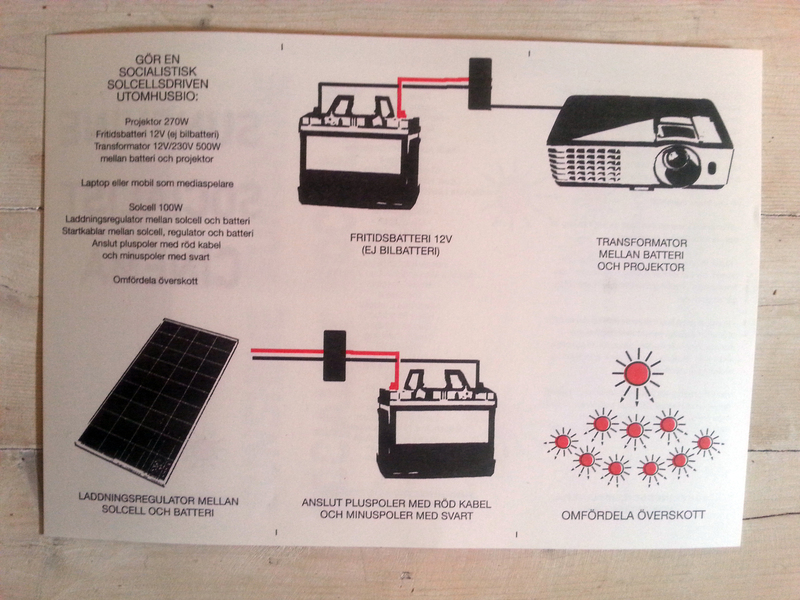 Instructions, or recipes, for Classroom Takeovers, Antifascist Action, Coalition Building, and Independent Media, coupled with chapters on How To Turn Your Bicycle Into A Record Player, this is all about the ecology of the mind of the protester. A beautiful book about surviving disasters with your head held high. 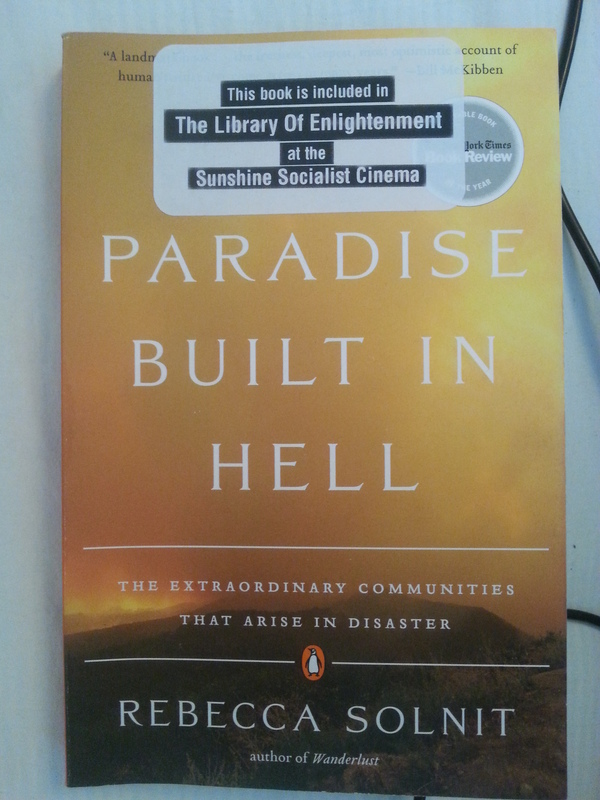 A Paradise Built In Hell by Rebecca Solnit discusses various natural and man-made disasters throughout the last 100 years, and how extraordinary circumstances bring out the very best in people. As it is filled with documented examples and witness accounts, we will not disregard it as optimistic fantasy. Although governments have reacted according to the idea that all people serve only their self-interest, protecting property above human lives, Rebecca Solnit have collected stories of how people, the victims of the disasters, actually abandon self-interest for the good of the community. Working together to relieve disaster they experience life as more full of meaning. As property is shared voluntarily, life is experienced as more rich. So there’s that to look forward to in the years ahead. 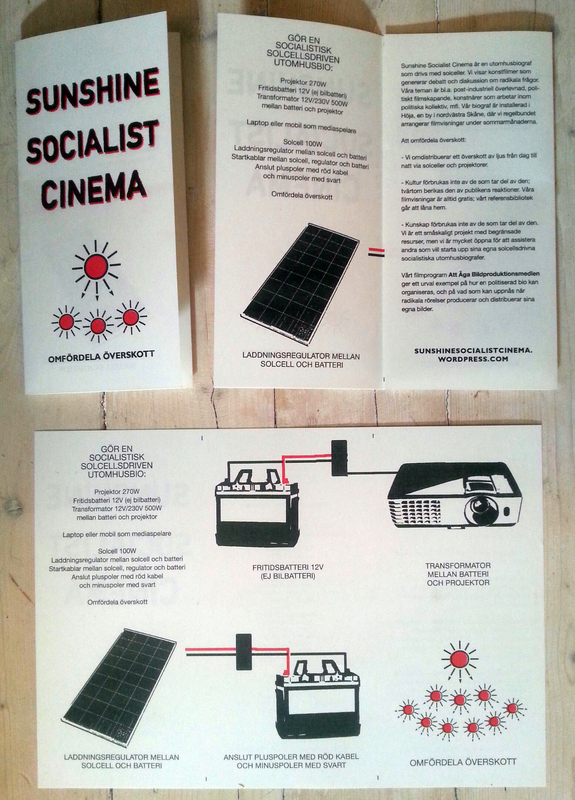 The screening on July 30 had a program inspired by discussions our study group, where we read 24/7 by Jonathan Crary and Nights Of Labor by Jaques Rancière. We began the evening with the film One Year Performance 1980-1981 (Time Clock Piece) which documents a year long performance by Tehching Hsieh: once every hour, day and night, for the duration of one year, the artist stamps a time clock in his studio. Every hour a photograph is taken of Tehching Hsieh next to the time clock. When the photos are run as a filmstrip through a projector, they form a stop-motion animation in which we see the physical condition of the artist changing dramatically. A year is summed up in six minutes. For those unfamiliar with the apparatus of control: A time clock was used in workplaces to keep track of the arrivals, departures, and breaks of employees, in order to follow and control workhours with precision. 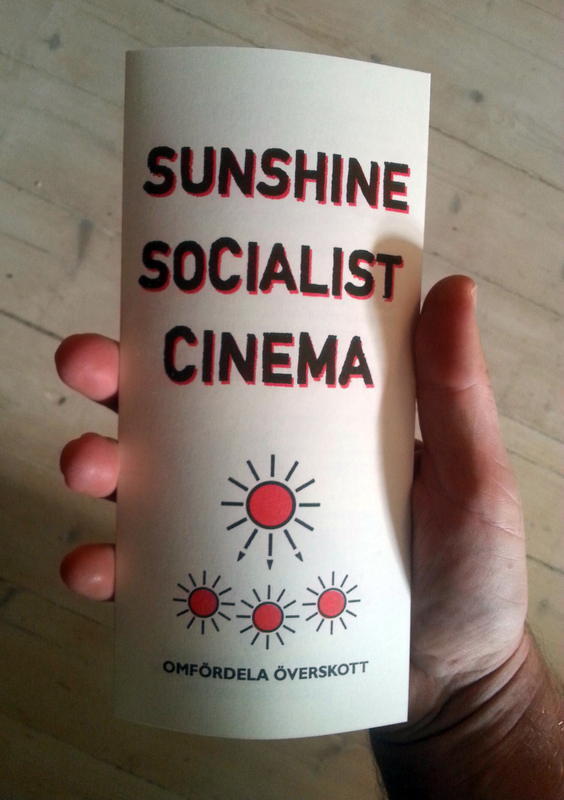 The idea of life and performance merging was developed further in a film by Swedish artist Saskia Holmkvist. In Interview with Saskia Holmkvist we see the artist Saskia Holmkvist being drilled in self-pesentation by an expert in media relations. Saskia Holmkvist tells us over and over what her art is about, and is adviced on how to present herself with honesty and natural authority. The artist is instructed in body language and posture, voice timbre and eye contact, all the while repeating phrases about how how her art deals with how we perceive something as honest and true. The interruptions, the visible microphones, and the self-awareness of the artist all point to how one of our stereotypically most honest figures, the artist, is involved in a constant ongoing performance of representing oneself. We ended the evening with a film by Chinese artist Cao Fei. In one of the new industrial zones of China, the Pearl River Delta, lies the OSRAM lightbulb factory. The region sees the overflow of global capital with provincial workers’ migration, wherein young laborers from the inland are drawn to an ongoing reform of culture, capital and forms of working. the artist Cao Fei came to the OSRAM factory to produce an art project together with some of the young workers who dream of other utopias than the one which currently controls their lives. During six months, they attempt to express and give form to their dreams, through music, dance, and in a film which gets the title Whose Utopia. All around them, work goes on as usual at the conveyor belts. A heartfelt thank you to the audience at the screening!